If you’re unsure of finding an all inclusive holiday that will truly live up to your long awaited and earned holiday then FirstChoice really is the sure thing. Not always the cheapest but knowing you won’t end up on an a disappointing holiday is not worth the risk! We are using First Choice for the 3rd year in a row. After pricing around it always comes back the best by far. 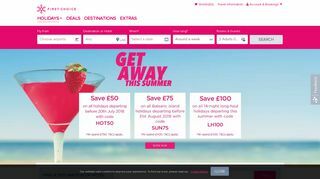 The website has a great lay out so simple and easy to follow and the payment options for the holiday are really helpful as you can pay installments after an initial deposit and a final balance date or altogether if you wanted. I have never needed to contact customer services with any problems or concerns so I am unable to leave comments about their team. All round I give a 5* rating and will most definitely recommend to friends and will be using them again for my future family holidays.